On Sale Now! Free Shipping Included! Save 5% on the Marcy Competitor Adjustable Olympic Weight Bench with Leg Developer for Weight Lifting and Strength Training CB-729 by Marcy at Strongman Pictures. MPN: CB 729. Hurry! Limited time offer. Offer valid only while supplies last. 5-POSITION ADJUSTABLE BACK PAD - The Competitor Olympic Bench has a multi-position back pad that can be altered to suit your workout routine. It features independent, adjustable-height crutches with quick-release pop-pin knobs to help you find your ideal position. Perform many different training exercises with the bench's various configurations, such as chest, decline, military, and incline lifting positions. 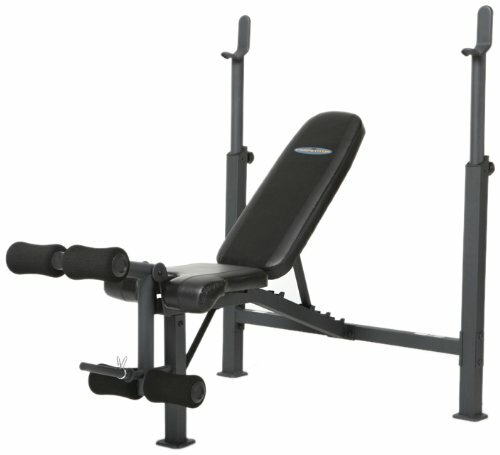 DUAL-FUNCTION LEG DEVELOPER - This bench has a dual-action leg developer to boost your lower body. It also comes with padded foam rollers for maximum comfort on your ankles and knees. HIGH-DENSITY FOAM PADDING - Marcy's Competitor Bench is made with thick 2-inch pads to let you exercise comfortably. It also supports the body to reduce muscle fatigue during workouts. The foam padding boasts outstanding stability, endures a lot of pressure, and is guaranteed to resist heavy lifting. OLYMPIC-WEIGHT PLATE POST - This bench has high-density upholstery and can hold up to 600 pounds. Olympic-sized weight plates can be used with it as well. COMFORTABLE FOAM ROLLERS - The foam roller pads are specially contoured to support your knees and ankles. Develop your major lower-limb muscle groups while you tone your upper-body muscles. You can perform a wide range of exercise routines on this weight bench.